Even hardened by weeks of bloodshed on the streets around his parish, the Rev. Edwin Román Calderón was not prepared for what he saw on June 2. Junior Gaitán, 15, was carried into his small church in Masaya, a small city about 20 miles south of Nicaragua’s capital, Managua. He was bleeding heavily. Junior Gaitán died on the floor of the small San Miguel Church. He was one of at least four people who died on Father Román Calderón’s parish grounds between May and July, when mass protests against the government of Nicaraguan President Daniel Ortega descended into bloody chaos. Law enforcement and groups of heavily armed and masked civilians attacked unarmed protesters with live ammunition, killing dozens in Masaya alone. Masaya has symbolized the escalating political crisis that has a stranglehold on this small Central American nation. The 58-year-old priest and his small parish were caught in the middle of the fighting, ultimately becoming another target of government forces. When America visited Masaya recently, the bullet holes in the church’s walls were still visible. There were three grey, gaping holes slightly to the left of the front gate. Inside the church, a few thin beams of light marked bullet piercings in its corrugated roof. Disproportionate use of force by police—sometimes resulting in extrajudicial killings, enforced disappearances, arbitrary detentions and torture—and infringements on free expression and peaceful assembly were documented by U.N. investigators. More than 300 have died since the street protests began. For weeks, Masaya has symbolized the escalating political crisis that has a stranglehold on this small Central American nation. The violence started in April, when mass protests against a proposed social security reform were violently repressed by the government. The initial shock among protesters at the brutal response escalated quickly into nationwide anger against a government and president many Nicaraguans believe have become dangerously authoritarian, if not outright dictatorial. They would soon demand Mr. Ortega’s resignation. The opposition was fueled by years of simmering anger over the increasingly autocratic behavior of Mr. Ortega, the former leftist revolutionary who, as leader of the Sandinista Front of National Liberation, toppled the dictator Anastasio Somoza in 1979. His guerrilla movement transformed into a political party, Mr. Ortega governed as president between 1985 and 1990 and was again elected into that office in 2007. During his second term, Mr. Ortega managed to spur unprecedented economic growth in what is still one of the poorest nations in the Western Hemisphere, but critics say the growth took a heavy toll on Nicaragua’s young and fragile democracy. The president co-opted most media in the country, purged Congress of any meaningful opposition and filled the nation’s Supreme Court with allies. He has been accused of manipulating elections. Mr. Ortega arranged to have his wife, Rosario Murillo, named vice president, a move many critics say suggests he has anointed her as his political successor. Masaya, a sleepy provincial city of some 150,000 inhabitants and traditionally popular among tourists for its large artisanal market, has experienced some of the most vigorous resistance to the Ortega government. This spring protesters tore cobblestones from the streets and set up roadblocks on strategic intersections. They were soon confronted by police and paramilitary groups. The priest saw no other option than to open the gates to the garden that separates his home from the church. He told America that terrified and wounded protesters did not dare go to local hospitals and clinics, fearing arrest. His parish became a makeshift hospital. The United Nations reports this week that the violence and insecurity in Nicaragua has pushed tens of thousands of refugees into Costa Rica, Honduras and other neighboring states. Helping wounded protesters ultimately made Father Román Calderón a target of the government as well. Days after the heaviest clashes, in May, he began to receive threatening phone calls. There were rumors that he had been added to a government blacklist. Several weeks after he first opened his parish to wounded opponents of the president, he decided to flee. He initially stayed at the home of Álvaro Leiva, the secretary of the Nicaraguan Pro Human Rights Association, in Managua. Bur Mr. Leiva himself fled to neighboring Costa Rica a month ago, and the human rights association, citing serious threats, closed its offices in the capital. Masaya, meanwhile, had been purged of roadblocks and most protests after government forces swept into the city on July 17 during “Operation Cleanup,” a nationwide offensive to end the opposition protests. At least 24 people, including several in Masaya, were killed. As protests have subsided in recent weeks, Mr. Ortega has declared the country to have “normalized,” but critics strongly contest that narrative. In August human rights groups accused the government of pursuing opposition sympathizers and imposing arbitrary detentions and torture. That includes dozens of priests and church officials, who face increasing hostility from the Ortega regime. Although the church was initially asked to mediate between opposition groups and the government, the dialogue has been strained by mutual distrust. Bishops like Silvio Báez, the auxiliary of Managua, have openly and frequently criticized the regime for its alleged human rights violations and accused Mr. Ortega of repeatedly violating the conditions for the beginning of a national dialogue. The president, in turn, has repeatedly accused Catholic priests who have criticized him of planning a coup. Supporters of Mr. Ortega have attacked church officials on several occasions, even wounding Bishop Báez in a knife assault on July 9 during a visit to the town of Diriamba. During pro-government protests, Catholic priests are caricatured as allies of the opposition and enemies of the president. 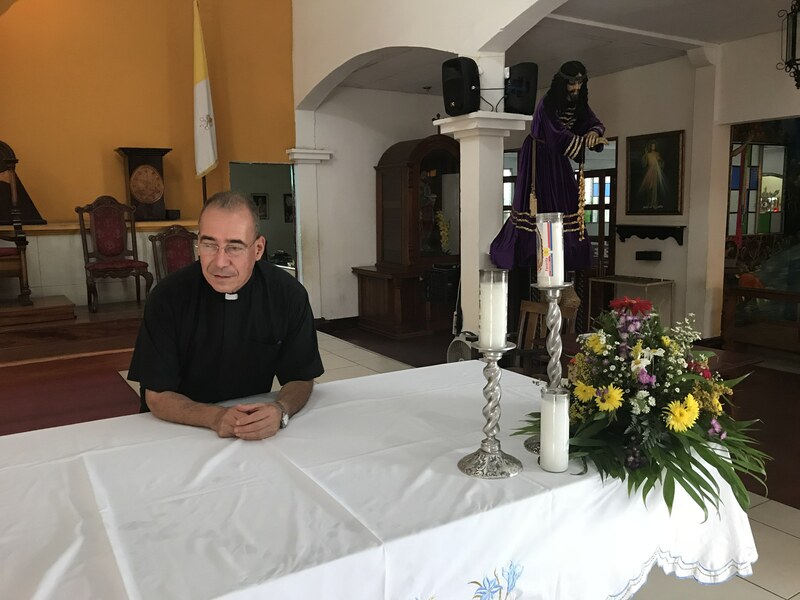 This article also appeared in print, under the headline "A Nicaraguan priest warns of further persecution of the church ," in the October 1, 2018 issue.